You can’t do any electrical work yourself but whether you’re renovating or building new, it’s good to get to know the basic requirements and regulations. Whether you’re building new or renovating, know that if you’re undertaking any kind of electrical work in ROI only a Registered Electrical Contractor (REC) is now allowed to carry it out. An REC is someone who is either on the RECI or ECCSA register. The only exemptions are for minor works such as replacing a light switch or light fitting, providing the existing circuit is retained. The fine for non-compliance is up to €15,000 and three years in prison. Even though it is not a legal requirement for minor electrical works to be completed by an REC, the work must be in compliance with the National Wiring Rules and from a safety perspective should only be carried out by competent individuals. The situation is different in the UK; while electricians must be deemed ‘competent’ there is little Government oversight regulating the industry. Indeed, in NI there are no statutory requirements for electrical work done in homes. However all wiring in NI should comply with the Wiring Regulations published by the Institute of Electrical Engineers (IEE). The IEE regulations lay down procedures for inspection and testing electrical installations. Registered UK bodies active in NI include the NICIEIC, the Electrical Contractors Association and the National Association for Professional Inspectors and Testers. These organisations register and assess electrical contractors so it’s a good idea to pick someone who’s registered with them, or someone who is registered with the home grown campaign called Sparksafe. Sparksafe is led by the Electrical Training Trust (ETT) and consists of a licensing scheme to register qualified electricians in NI, which the ETT estimates total approximately 3,000. The campaign has been developed to stamp out unqualified operatives describing themselves as electricians and also to improve electrical safety standards. Sparksafe’s Licence to Practice (LtP) certification scheme allows electricians to sign up by proving their qualifications and experience. There are three categories: Licence to Practice for Qualified Electrician, Restricted Electrical Worker and Apprentice Electrician. A pilot is in place whereby contractors tendering for specific Government construction contracts will only allow electrical workers who are Licensed to Practice to be deployed on site. Mains electricity (230V, alternative current) is fed into our homes to power everything from the TV to our computer screens. Most of our lighting fixtures use mains electricity but in certain circumstances, such as in bathrooms, extra low voltage (12V) electricity is sometimes used. Extra low voltage lighting is indeed safer and can be used in standard fixtures, such as track lighting, but the light output doesn’t tend to be as high as those designed to work with mains voltage.Extra low voltage luminaires will tend to be bulkier because they contain a transformer (interface between mains and low voltage). Low voltage lighting does not consume less energy than mains voltage. In ROI you will not be connected to ESB Networks without a Certificate from your REC which proves that the installation complies fully with ET101:2008, the 4th Edition of the National Wiring Rules published by ETCI (see Wiring Rules). After completion of the works, s/he will test the wiring in the house to ensure it is safe to connect to the mains and will then issue a certificate to RECI or ECCSA who, after vetting, will then pass it on to ESB Networks. A supply will then be made available and your REC will connect the ‘tails’ (thick cables) to the meter. 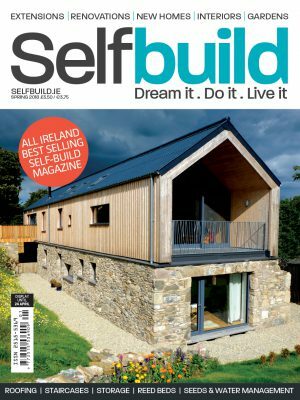 For a new build a standard connection charge is €1,851; additional requirements such as three phase electricity for a heat pump for example, will be more costly. An engineer will come out and assess your requirements, including location of the meter, and a quotation will be issued to you on that basis. If you’re reconnecting an old meter the charge is considerably less but the actual fee will depend on your circumstances, including for how long the meter has been disconnected. In NI a Connection Card must be sent to Northern Ireland Electricity (NIE) before a meter will be fitted or reconnected. A competent electrician must sign the card but there is no requirement for them to be on a registered list. If your electrician is approved by a recognised organisation (see Choosing an electrician) then NIE may allow them to make the connection from the meter box to the tails. Otherwise you will have to pay NIE a small sum for them to do so. The standard charge for a new installation is £876 but this will depend on your circumstances. Retesting of your home is often required after 10 years. The National Rules for Electrical Installations as published by the Electro-Technical Council of Ireland (ETCI) are in operation in ROI. While they’re described as a voluntary specification, they are recognised by the Health and Safety Authority as a means of complying with the Electricity Regulations. They have also been formally recognised by the Commission for Energy Regulation (CER) as the technical rules to be observed by registered electrical contractors. In NI the standard applied is BS 7671, also known as the IEE (Institute of Electrical Engineering) wiring regulations. In both NI and ROI the Building Regulations are the relevant statutory documents. – A householder or visitor in a wheelchair must be able to use switches and sockets. Therefore switches must be mounted between 900mm and 1200mm measured from the finished floor and sockets between 400mm and 1200mm. – If light switches are made of metal they must be earthed (non metalic switches are safer, that’s why the standard is plastic). – Mains powered fire detector (with battery backup) is required in every bedroom (in ROI) and in the hallways/escape routes. – Mains powered carbon monoxide detector (with battery backup) is required in any room with an appliance that has a flue, e.g. boiler. – You will need to ensure that your REC installs an earth electrode outside your dwelling. – It is mandatory in modern installations to use a trip switch or RCD (Residual Current Device). It’s a safety device to break the circuit if the currents in the live and neutral cables are not equal, i.e. some of the current is going where it shouldn’t. The device can prevent not only fires but also electrocutions. All the cables must be put in before the walls are plastered, which means that you also have to decide on the position of the socket outlets, lighting points, and other electrical units (thermostats, fire detectors, audio system, etc.) in each room. With the circuits in place, the steel mounting boxes for sockets and light switches can be fixed to blockwork walls and a cable run to them. In stud walls and timber frame panels, the boxes for sockets and switches must be fitted before the plasterboard has been fixed. Pendant lights will require ‘grounds’ to be placed between the joists before you plasterboard the ceiling – it’s a piece of timber onto which the fitting can be screwed. Letting the cables stand proud of the wall isn’t common as they are usually chased but old houses may want to retain this feature, in which case you will need timber to box out the cables. Old sockets, e.g. Bakelite, will require a base so they can be earthed. In order to test the wiring your REC (ROI) or qualified electrician (NI) will need to have fitted switches, sockets and a simple batten or pendant light fitting. It therefore makes economic sense to have your own ornamental fittings purchased ahead of this stage and so save doing it twice; once for testing and again when you have the correct fixtures. Although you may not need it immediately, technology is moving ever faster and by installing Cat 5e or Cat 6 cabling for broadband you can call upon it at any date in the future, bearing in mind that IPTV (television over the internet) is becoming increasingly common. As such it could prove to be a useful selling point and it represents excellent value. Bathrooms and ‘wet’ areas generally are danger zones for anything electrical and installations must conform to Building Regulations in NI and ETCI wiring regulations in ROI. In both NI and ROI, bathroom (and some outdoor lights as well), are covered by a special rating, the IP, which stands for Ingress Protection. The IP is followed by two numbers. The first number refers to the degree of protection against particles or solid objects, the second to the amount of protection against the ingress of moisture. The range is from 0 for no protection, to 8 for a light which can be totally submersed. For example, a light might be marked IPX4 (X means it hasn’t been rated), which means that it will have been tested for protection against water coming from any direction but has no rating for protection against particles or solid objects. ETCI Regulations divide bathrooms into zones for the purposes of electrical installation. Zone 0 is directly in contact with water, either in the bath or shower, and lights must be immersion proof or IPX7. 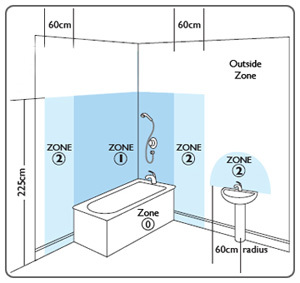 Zone 1 is directly over baths and showers, up to 2.5m. Fittings here must be safe when subjected to a jet of water, that is they must be extra low voltage (max 25V) and be rated IPX4. Zone 2 is the area 0.6m around the bath, basin and shower, here fittings must be splashproof, and also carry a minimum rating of IPX4. Finally, Zone 3 is anywhere outside Zones 1 and 2 (subject to specific limits), and where a water jet is not to be used, there is no IP rating required. In all zones of a room containing a bath or shower, every circuit must be protected by a dedicated RCD having a rated residual current not exceeding 30mA, except where protected by SELV (Safety Extra Load Voltage). If it sounds complicated, that’s because it is. Another reason you really have no choice but to hire a qualified electrician on the job (NI) or an REC (ROI). When it comes to choosing fixtures and fittings, the level and height of task-lighting will depend on the activity. Be aware that vanity lights are intense and can lead to glare and that wheelchair users may require lower-level lights. The accessibility of light switches should also be considered for each user and located where most convenient. You might also want to consider a heated demister matt behind a bathroom mirror to prevent it misting up when you run a bath. The mats can be connected to your lighting system. – Lights must be condensation proof. – Light switches must be positioned outside the bathroom. – Standard sockets aren’t allowed however a low voltage socket can be added to your basin light for shaving. – It is not permitted to bring portable lighting into a bathroom: it must all be architectural (built-in). – All new shower rooms and bathrooms must have extractors fitted to comply with Building Regulations. These must have a rating of at least 15 litres of air per second and if there are no opening windows in the room, be fitted with a timer (a fan will automatically switch on for a set period of time and stay on until you leave the room; do not tamper with it!). If you want to install the extractor directly above a shower, you must use a low voltage model. You will need a 100mm diameter hole (or more, depending on the unit you choose to buy) in the exterior wall or into the ceiling with ducting through the roof space. – Ventilation units need a fuse box. – All the metal pipework and any metal baths or other fixtures must be cross-bonded to earth. If you replace a section of copper pipe with plastic you may interrupt the earthing. This is another example why everything must be handled by an REC – the law is there to protect you – or a qualified electrician (NI). Design your lighting scheme according to who will be using the house – their needs and preferences will determine how to best light the various rooms and hallways throughout. For instance, elderly people require a lot of lighting, in the order of 100W tungsten bulbs as a benchmark (which can now be obtained with good quality 23W CFLs). And it’s not just the elderly who require adequate lighting; all eyes will strain if there isn’t enough illumination to read, work on your computer, etc. Guide to fixtures, sockets and bulbs available here. Think of placing lights in the roof space and in your cupboards, and beneath the kitchen wall units. Also bear in mind the brightness of adjoining rooms and hallways. The idea is to keep the design as simple and as flexible as possible. This includes strategically placing plenty of wall (and possibly floor) light sockets for sidelights and table lamps, as you may wish to change the layout of the room at some future date. This also allows you to put on a number of lamps from a single switch at the door. When planning the layout of each room, think of where you need the light to fall rather than where they’ll be positioned – this will avoid geometric shapes on your ceiling that may remind you more of a commercial building than a home! If you’re considering specific activities, such as reading or being on the computer, then think of putting task lighting behind the object (chair, desk, etc. ), evaluate the appearance of the light required (“warm” light is the most common for everyday use) and be mindful of glare or, alternatively your shadow, falling over a screen or sink. As for mood lighting, Light Emitting Diodes (LEDs) are particularly good at casting different light schemes, both indoors and out; plus you don’t have to change the bulbs on a regular basis. Products such as LED “flex tape” can be mounted around furniture contours to provide dynamic light. This flex tape is not to be confused with OLEDs, which are mostly used as backlights, generally found on high quality TV screens. In the context of home automation, it is now possible to integrate wireless audio systems onto low voltage track lighting to provide surround sound. You can now also connect proprietary light switches to your modem to wirelessly control the lighting in your house from a remote, computer or smart phone. You can also retrofit switches on your heating, alarm, etc. to control them via this same system. This is particularly helpful in a renovation as it avoids having to cable the house and rip up walls in the process! Stand-alone wireless products are also readily available, e.g. CFLs or LEDs with dimming remote control. Indeed, rewiring or placing new fittings will cost you money so putting into place a wireless system is a good idea in that context.